My dog Stanley Kubrick has passed away. 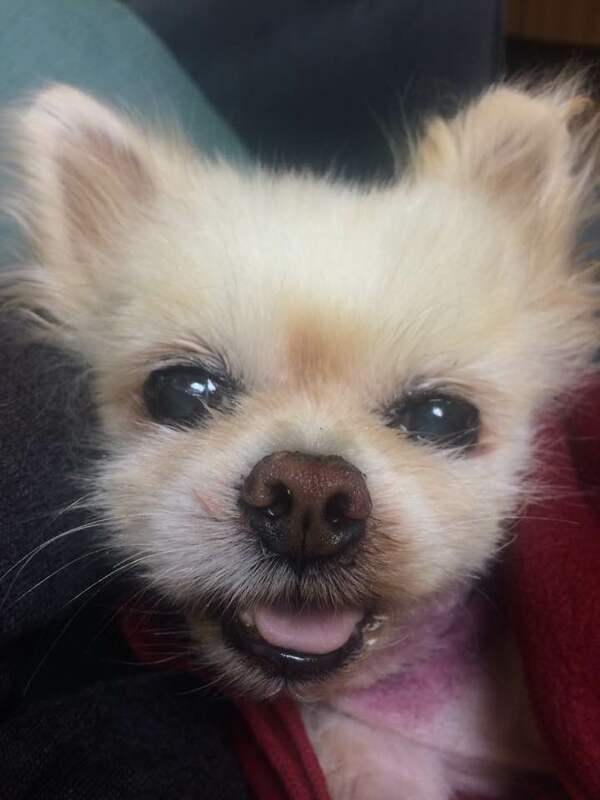 My senior rescue Pomeranian passed away on June 5th. Adopting a senior rescue dog was the best thing I ever did! Stanley Kubrick Banali was found on the streets of Covina in June of 2013 and taken to Baldwin Park shelter where they estimated he was around 12 years old and he weighed 5 pounds. He had a pretty bad skin condition and his hair was stringy and long in some places and bald in others. In spite of the hard life he had living on his own on the street he was very friendly. One Dog Rescue posted his intake photo on facebook which I happened to see. I posted a comment saying we would foster him. A few days later I got a call asking if we would really foster and I said yes. Some sweet and generous donor paid for him to have several rotten teeth extracted before we got him. On June 27th I was at the Stanley Kubrick exhibt at LACMA and got the call that he was ready to be picked up and I called Frankie to send him over to get our new little foster and you can guess where I got the idea for his name. He was super excited to ride in Frankie’s car for the first time and looked out the window in awe with a big smile on his face. I spent the first weekend with him holding him like a baby and staring into his eyes. I wanted him to know he was safe and that someone really sees him. He bonded with me right away. He learned his name in three days and ingratiated himself with the other dogs easily. He loved running outside with them and really loved it when he was the first one out. He was much smaller than them but didn’t take any crap and soon became the alpha dog bossing them around. He had a very expressive face and could communicate anything to us. He is the only dog that I have ever seen smile like a human. He became such a part of our family we just had to adopt him. He became healthy, gained some weight and grew a huge poofy long coat. If you touched him while he was sleeping he would wake up fighting and sometimes bite before he even knew what was happening. This was left over from living on the streets. It got better over time but never completely went away. He became my baby and went almost everywhere with me. He was the absolute heart of our family and the closest pet relationship I ever had which I can’t even believe was possible after some of the close pets I have had. He liked everyone but always looked at me to make sure someone was ok before relaxing in their arms. He absolutely adored anything smaller than him. Frogs jumping in the yard was a delight and he mothered kittens. His favorite treats were dried chicken, salmon and cheese. After a few years his health decined. He was on a number of medications and pretty much lost the abilty to walk. He had a heart murmer and a herniated disc and digestive issues. We had him in a little bed next to one of us at all times. My sister started helping with his care and also fell madly in love with him. He was a fighter in spirit and was determined to do what he wanted even if his body wouldn’t always cooperate and never stopped loving us all as that was what he lived for. He fought like a warrior all the way to the end and finally lost the battle in my arms, surrounded my husband, my sister and all the love in our hearts, smiling at all of us till his last breath. His loss is an enormous hole in our family and we are all heartbroken. He will be remembered, missed and loved for the rest of our lives. No one will ever look at me the way Stanley did and I will cherish the memories forever. So sorry to just learn of his passing. He was very lucky to have been found by you and Frankie and I know you were lucky to have him. My heartfelt sympathies are with you. Please know you’re in my prayers. Stanley looked to be a precious loving being and not a dog. None of them are. They’re souls of good humans from another time.